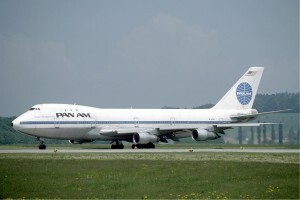 The Smithsonian’s Air and Space Magazine recently published an article about the last flight of the airline workhorse, the Boeing 747. You can find the Smithsonian’s article by following this link: https://www.airspacemag.com/daily-planet/queen-skies-retires-180967588/ It is an interesting report. In the summer of 1969, I turned 16 and became a parent’s worst nightmare – a teenager with a drivers’ license. At the time, little did my mom know it could and was about to become worse – a teenager with a pilots’ license. Shortly after I became a licensed driver, National Airlines brought a 747 into Tampa International. It was on a day I was free and had access to my mom’s station wagon. This was long before 9/11 and a kid could pretty much do whatever he or she wanted at an airport without much scrutiny from the local authorities, as long as they reasonably behaved. The day the 747 was to land at Tampa, I drove to the top of the parking garage and parked near the westside, the side facing the runway were the big Boeing was to land. After a while, the giant behemoth showed up over the city. It circled the airport a couple times and then lined up to land. In my ignorant mind, I thought the airplane would use most of the 8000 feet of available runway to land. I say “my ignorant mind,” because, at the time, I had no idea how weight affected performance. I also knew nothing about wing area or wing loading, or how they changed takeoff or landing performance. As I watched the seven-four gracefully descend on final, I braced myself to watch the pilot struggle to get it stopped on the runway. In my mind’s eye, I could see the captain and his first officer gripping the yoke for leverage and holding the brakes together in trying to get it stopped before running off the end of the runway. I just knew that would happen. Imagine my surprise when the giant airplane alighted more like a bird and used only one-third of the 8000 feet of available runway to completely stop. I did not know how that was possible because all the media hype was about how heavy this airplane weighed at its operational weights. As I thought about it, I came to realize the aircraft was well under gross weight, explaining why they were able to stop so quickly. I just knew that once they refueled the 747, it would take much more runway to become airborne than what it took to land. I hung around until it got time for the airplane to depart. As I watched from the top of the parking garage, I had a feeling of excited anticipation as the 747 taxied out. I wondered how much runway the airplane would use, thinking it would use at least three-quarters of the 8000 feet of runway 18L. As the pilots pushed up the throttles, I could see the thrust blasting back from behind the engines. It was pretty exciting. And then the big bird started to roll. I was absolutely astonished when the airplane rotated early and lifted off the runway well before the halfway point. Again, I lacked knowledge in the concepts of weight, wing area, and available thrust. These concepts would come to me later in life, allowing me to reflect back on this day with understanding. Today, what I fail to understand is how this airplane became the iconic symbol of the airline industry from 1969 to 2017 – and now she’s gone. She’s out! She had a long life spanning almost 50 years and that’s what I don’t understand. I mean, it was just yesterday she flew for the first time. How did the time pass so quickly? This entry was posted in Uncategorized and tagged a parent’s worst nightmare, a teenager with a drivers’ license, a teenager with a pilots’ license, inexperienced pilots, memories, National Airlines, Smithsonian’s Air and Space Magazine, the Boeing 747, the last flight, the summer of 1969, time passing so quickly, Unbelievable - The 747 Is Retired. Bookmark the permalink.